Safety Signs are a requirement by law to help protect the safety of every person. The regulations require organisations to use a safety sign where there is a significant risk to health and safety that has not been avoided or controlled by the methods required under other relevant law. give guidance and instruction in an emergency. It is therefore necessary that all staff be able to understand the message and the risks associated with not following them. It is the responsibility of all organisations and managers to educate their staff on the issue of all safety, as the consequences of not adhering to a danger safety sign could mean possible death. DANGER Danger signs are to be used where conditions are likely to be life threatening. PROHIBITION They indicate actions or activities that are not permitted. MANDATORY Signs that indicate an instruction that must be carried out. WARNING Warning signs warn of conditions that are NOT likely to be life threatening if the message is ignored. CAUTION Caution signs warn of a hazard or hazardous situations where care should be taken. FIRE Fire signs indicate the location of fire alarms and fire fighting equipment. EMERGENCY These signs indicate the location or direction to emergency related facilities and first aid or safety equipment. DANGEROUS GOODS This group of signs are used in the transport and storage of dangerous goods. 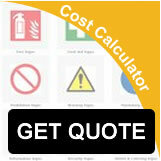 HAZCHEM Signs and Dangerous Goods Signs. These signs are prescribed in the "Australian Dangerous Goods Code" and various state governments "Dangerous Goods, Storage and Handling Regulations". TRAFFIC SIGNS This group of signs are used on roads systems, in car parks, factory areas and generally to direct people and vehicles. NOTICE SIGNS These Notice signs do not comply to Australian standards but are produced due to popular demand. They are used to convey information of a general nature. 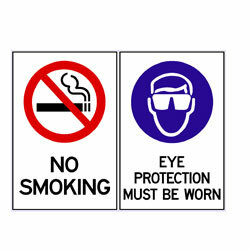 GENERAL SIGNS These signs are not compliant to AS1319 for safety signs, however they have been added to provide solutions to safety and improve the working environment. CUSTOM SIGNS Any sign, size or shape – just tell us what you want and we will design and produce it. Safety signs are not a substitute for other methods of controlling risks, such as engineering controls and safe systems of work or even common sense.